Here are two videos of Peruvian children singing beautiful Gregorian chant as part of the missionary work done by the Serviteurs des Pauvres du Tiers-Monde (abbreviated "SPTM" and meaning "Servants of the Third World Poor" or "Servants of the Poor of the Third World" as it is called on the movement's English language web page). The first video shows more of the work done by the monks ("contemplatives in action"). The second shows the poverty of one of the towns where they work. This missionary movement has been supported for the past few years by the Benedictine monks of Fontgombault, who are well known for their Gregorian chant in France. The movement's website explains that the movement was founded in 1983, was given Pope John Paul II's blessing, and is based in Cusco, Peru. Its founder was a Sicilian Augustinian named Giovanni Salerno, who was also a doctor. They have 4 houses in Cusco, one in Lima, Peru and in Hungary. Their charism is to serve Christ in the poor in that part of the world, giving them the testimony of a humble and silent service like that of Jesus Christ. In Cusco, they are working with 700 children who go to them to study, play, receive medical care and receive a Catholic catechesis. They have recently opened a free elementary school for the poorest children. They give a priority to prayer and contemplation, the liturgy of the hours, the rosary, meditation, reflection on the book "The Imitation of Christ" by Thomas à Kempis (their rule of life), frequent spiritual retreats, liturgical life with Gregorian chant in Latin, the Eucharist, the Word of God, and abandonment to the Holy Spirit and to Divine Providence. I had not heard of this missionary work before today. Anyone who knows more about it is welcome to add information in comments. Hat tip to le petit placide. The Benedictine nuns of the Abbey of Our Lady of the Annunciation of Le Barroux, France, at the dedication of the abbey church and consecration of the choir. Merci à le petit placide. Prince of Peace Abbey, a Benedictine abbey here in San Diego County, was founded almost 50 years ago by monks from St. Meinrad's Archabbey in Indiana. St. Meinrad's, in turn, was founded in 1854 by monks from Our Lady of Einsiedeln Abbey in Switzerland. Thus, there is a San Diego County connection with Our Lady of Einsiedeln! 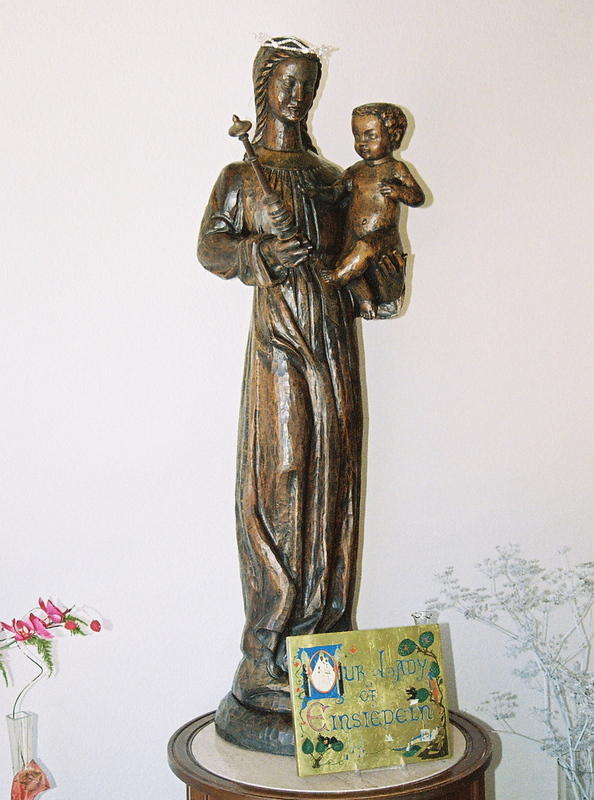 The photo here is one I took of the statue of Our Lady of Einsiedeln at the abbey here in San Diego County. Looking for videos of chant music for Advent, I was thus pleased to find two videos from Einsiedeln. The first is a video of the abbey with the sound of its seven bells. The second has the sound of the choir of the Cathedral of Einsiedeln singing a chant of the Salve Regina. Here is a link for a page with some information about the Shrine of Our Lady of Einsiedeln in Switzerland with a photo of the Black Madonna at the shrine and a map showing where Einsiedeln is. Hat tip to Father Demets at De Fide Catholica, who posted the first of the two, and to someone who posted a comment on his blog about the second. A post and photos of Clear Creek Monastery in Oklahoma from Andrew Cusack shows the continuing development of the new Benedictine monastery of the Congregation of Solesmes. A related post at Canterbury Tales finds humor in one of the photos. There was a post about Clear Creek on this blog in July of last year, with the links to the monastery website recently updated. That post also mentions the monastery of Benedictine nuns in Vermont from the same congregation, with links to their website too. 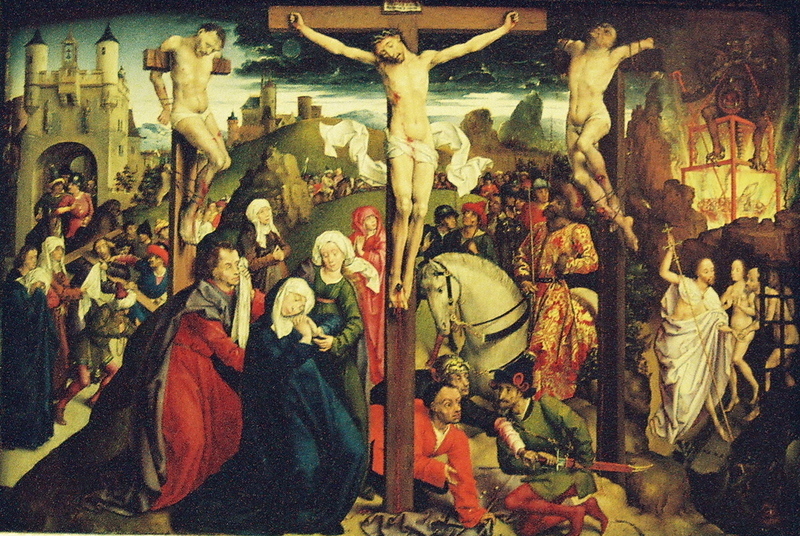 Picture: "The Crucifixion" by the master of Dreux Budé, Flemish, 15th century. Photo by me. Summorum Pontificum podcast: In Exaltatione Sanctae Crucis (introit and gradual in Gregorian chant). The Latin Mass Society today completes a training conference in the Latin Extraordinary Form of the Mass at Merton College, Oxford. The conference started on Tuesday. A very short YouTube video from the conference, posted 5 hours ago, is shown here. The French Schola Sainte Cécile is at the conference and has posted photos on its website from Wednesday evening's Vespers of St. Augustine and from yesterday's Solemn Mass for the Beheading of St. John the Baptist, and pontifical vespers. One of the photos shows the BBC camera, as the event made the TV news. The Oxford Events blog previously posted information about some events that were open to the public. Shawn Tribe, at The New Liturgical Movement, also has two posts with photos. If I find an embeddable video in the next couple of days, I will add it here. This is not the first time instruction in the traditional Latin form has been offered at Merton College. Notably, the 11th annual CIEL International Colloquium on the Roman liturgical tradition was held there in August, 2006, reported by Shawn Tribe. That 2006 colloquium included Masses from both the 1962 and 1970 Missels, in Latin and ad orientum. In the U.S., the Events Calendar for Church Music Association of America includes several upcoming events related to the Latin Mass and Gregorian chant, including a Symposium on the Motu Proprio offered in Stamford, Connecticut on September 14-15. A Seminar in the Sung Mass for Celebrants is scheduled for October 17-19 in Chicago, which will include both the Novus Ordo in Latin (from Solesmes) and the Extraordinary Form (1962). The New York Times ran an article on April 5 about the 55 monks at the Abbey of Solesmes in France and the increasing popularity of Gregorian chant. Here is a link. The article includes comments from the abbey's choirmaster, Dom Yves Marie Lelièvre, a former violinist. There is also a very nice photo of the abbey. Hat tip titusonenine.